After two days visiting areas of the Gulf Coast affected by the BP oil leak, US President Barack Obama has addressed the nation live from the Oval Office inside the White House. You can see video from the White House at the top of the page, and analysis from BBC correspondents below, as well as the latest from the blogs, Twitter and e-mails from our readers. 2200: Our live coverage ends now - but you can keep up with the latest developments here. Thanks very much for joining us. 2156: Joshua Green, The Atlantic "Seizing the moment," invoking World War II vets and the moon landing are all well and good, but it rang pretty hollow to me... For all his praise of the House climate bill and talk about the "consequences of inaction" and so forth, not once did he utter the phrase, "It's time to put a price on carbon." And that suggests to me that this speech was primarily about containing the damage to his administration, and was not the pivot point in the energy debate that many people were hoping for. 2155: Kedar from India writes: We make BP pay for this damage. Who will pay India for the Bhopal gas tragedy? 2152: Taegan Goddard, Political Wire Though Obama called for a "national mission" to transition to clean energy, he was vague on what he actually wants to see in a comprehensive energy bill. In doing so, Obama is just another president that has refused to ask Americans for the necessary sacrifice to finally achieve this greater national goal. He missed a golden opportunity. 2140: Daniel K from Philadelphia, US, writes: I think Obama gave a good speech, and it was exactly what we need to hear from a leader about this crisis. 2137: The BBC's Paul Adams in Washington When the president speaks from the Oval Office, it's serious, and it's personal. This was Barack Obama attempting to show that he is now in charge of dealing with the worst environmental disaster in US history. He spoke in lofty terms about moving away from fossil fuels, embracing a clean-energy future and shaping the country's destiny. But most Americans just want the leak to stop and that, two months after it began, remains a distant prospect. 2132: This just in: The White House announces President Obama will address reporters in the Rose Garden following his meeting with BP execs. We weren't expecting another appearance: does that mean the White House is unhappy with how tonight's speech has been received? 2130: You can read the full speech here. 2125: Ezra Klein, WashingtonPost.com The optimistic take, at least for environmentalists, is that this is the language and approach Obama uses when he really means to legislate. The pessimistic take is that Obama shied away from clearly describing the problem, did not endorse specific legislation, did not set benchmarks, and chose poll-tested language rather than a sharper case that might persuade sceptics. 2115: Linda R Friar from Pacific Palisades, California, US, writes: Obama needs to deal more effectively with the current environmental disaster reaching our shores, and stop campaigning about energy proposals that at the moment are irrelevant. 2104: That's it for President Obama's first address to the nation from the Oval Office and Robert Gibbs's live question session. But you can find more quickfire analysis and reaction brought to you here for the next hour. Stay with us! 2103: Mr Gibbs ends the live question session talking about the long-term need to restore the coastline along the Gulf. He'll be taking more questions from the public tomorrow. 2102: Michael Whitney, firedoglake Basically, Obama offered no specifics on how to bring some life to the recovery effort, used BP's unfounded statistics to promise about the cleanup, and again offered no specifics for what he will do to help the people of the Gulf. There's a whole lot of pretty sentiments and references to maritime tradition, but nothing about what the administration will do differently. 2056: Mr Gibbs says that the government needs to end its subsidies for big oil, but it doesn't look like he'll get much co-operation from Congress on that front. Today, the Senate voted against closing tax loopholes that would have resulted in $35bn in taxes from oil companies. 2055: Yikes! Technical hitches on the White House live page. 2052: Mr Gibbs appears to be sticking closely to his unofficial job description: don't overshadow your boss and don't make news unintentionally. He has referred several times to his son, and his hopes for a cleaner future for him. 2051: Chris Cillizza, The Fix, WashingtonPost.com Obama began the speech by drawing an overt comparison between the war against al-Qaeda in Afghanistan and the "oil spill that is assaulting our shores and our citizens". He repeatedly referred back to military terms - "battle" and "siege" to name two - to frame the challenge before the country, and even referenced the build-up of material in the early stages of World War II as evidence of the American people's ability to conquer seemingly impossible challenges. The goal of all that war talk? To unify the country behind the government's attempts to solve the problem. 2050: Tiina from Helsinki, Finland, writes: The US has to take serious and quick action on environmental issues. They must join global efforts - they have too much influence worldwide to stay behind. 2049: Mr Gibbs says he knows Mr Obama well and assures viewers that Mr Obama is not going to be the next in a long line of presidents who just walks up to Capitol Hill and says he is going to do something about America's dependence on foreign oil. He's going to do something. Mr Gibbs calls on Congress to take bold steps to assist the president. 2048: Mr Gibbs is careful to distinguish between "BP's oil spill" and BP's response, and the response of the administration. 2043: Daniel Foster, The Corner, National Review Online I have to admit I was somewhat surprised to see President Obama use his first Oval Office address to repeat populist platitudes about "making BP pay" and hit the bullet points, for the umpteenth time, of the Democrats' ill-advised cap-and-trade scheme. Oval addresses are best reserved for wars and resignations. 2043: Mr Gibbs says he will not let BP dictate media access to the Deepwater Horizon site. 2042: In case you are wondering, the purple bracelet Mr Gibbs is wearing is for the nine-year-old daughter of friends of his who is battling cancer. 2042: Donna Wills from Largo in Florida, US, writes: Please help us, this is all some people here know. Florida has been my home for thirty years and now it is slowly dying. 2034: At several points in his presidency, Mr Obama has used a speech to change the conversation. Remember the speech on race prompted by the Rev Wright videos? Remember the address to Congress about healthcare? Do you think he used his oratorical skills to good effect tonight? 2029: Wonkette We planned to do liveblogging on this historic night of Barack Obama's first televised speech from the Oval Office, but it went so quick! Still, we can live-blog whatever nonsense people say on the teevee in response, right? 2025: The BBC's Paul Adams in Washington It's all about Americans shaping their own destiny. The president has made a lofty appeal to American idealism. It won't be universally welcomed at a time when Americans are mostly worried about the more pressing need simply to stop the leak. 2025: We're now waiting for Press Secretary Robert Gibbs to answer questions from members of the public, who have made their submissions via YouTube. You can watch Mr Gibbs here. 2022: Jed Lewison, Daily Kos Turns out the President doesn't sound quite as eager to lift the moratorium as Drill, Bobby, Drill [Louisiana Governor Bobby] Jindal would like. 2020: President Obama ends his speech on an optimistic note, saying that Americans will pray that a hand may guide them through the storm towards a brighter day. 2019: The BBC's Paul Adams in Washington The president says the Minerals Management Service had "over the last decade" become "emblematic of a failed philosophy that views all regulation with hostility". Mr Obama is perhaps too subtle to blame the Bush administration by name for his present predicament, but this is clearly a jab at his predecessor. 2018: It's rare for Mr Obama to talk about God, but tonight he talked about faith several times, including this anecdote: "As a priest and former fisherman once said of the tradition, 'The blessing is not that God has promised to remove all obstacles and dangers. The blessing is that He is with us always.'" 2017: The BBC's Paul Adams in Washington The president says that he will "inform" the head of BP that "he is to set aside whatever resources are required" to compensate affected individuals and businesses. He wants to make sure that tomorrow's encounter at the White House is seen as an occasion in which he lays down the law. That he, not BP, is in charge. 2017: Is the US Senate listening to this message, because it's clear who President Obama is talking to here: "The one approach I will not accept is inaction. The one answer I will not settle for is the idea that this challenge is too big and too difficult to meet". 2016: Obama's rhetoric in this section is very reminiscent of his campaign 2008 speeches. He says: "The transition to clean energy has the potential to grow our economy and create millions of good, middle-class jobs - but only if we accelerate that transition. Only if we seize the moment. And only if we rally together and act as one nation." Yes we can? 2013: President Obama takes a passionate tone, asserting that the "the time to embrace a clean energy future is now". Emphasis on the "now". 2013: Now, President Obama reflects President Johnson's same concerns three decades ago: "Time and again, the path forward has been blocked - not only by oil industry lobbyists, but also by a lack of political courage and candour." 2011: The BBC's Paul Adams in Washington At a time when the president and his administration face criticism over the speed and scale of the federal response, the president quickly sets out the extent of what he calls "the largest environmental cleanup effort in our nation's history", while admitting that "there will be more oil and more damage before this siege is done". 2010: President Obama takes his first shot at his Republican opponents, saying that the mismanagement of the Minerals Management Service is "emblematic of a failed philosophy that views all regulation with hostility - a philosophy that says corporations should be allowed to play by their own rules and police themselves". 2009: President Obama says an independent third party will adjudicate claims for compensation, but gives very few details about how that process will work. Expect Press Secretary Gibbs to be bombarded with questions about that in the coming days. 2007: President Obama's tone is firm but calm and even. This is no Lyndon Johnson "bullhorn" moment, but he's not echoing Jimmy Carter's "malaise" themes either. It seems he's doing his best to be reassuring. Perhaps the best analogy is President Clinton? 2007: The BBC's Paul Adams in Washington "Unlike an earthquake or a hurricane," the president says. This is not his Katrina. 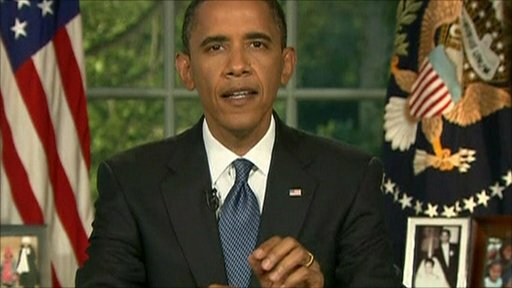 2005: Mr Obama uses tough language with regard to BP, saying he will "make them pay". But he doesn't dwell on BP, moving on to more positive news about the clean-up effort. 2003: Mr Obama opens by chronicling his response to the spill - perhaps an attempt to instil confidence in his management style? 2001: Following the speech, White House Press Secretary Robert Gibbs will answer questions from the public. For more details go to the White House website. 1957: Some interesting poll numbers provide context for tonight: according to Gallup, 59% of Americans believe BP should pay for damages and lost wages, even if it forces the company into bankruptcy. And 71% don't think President Obama has been tough enough on BP. 1955: Although Mr Obama is expected to have harsh words for BP tonight, Walter Shapiro of Politics Daily says: "An Oval Office address is too rare and too important a presidential event to waste time scoring cheap political points at the expense of BP." 1952: The oil executives received a thorough grilling on Capitol Hill today, but later, senators voted 35-61 against stripping big oil companies of $35bn in tax breaks they'll receive over the next 10 years. Are members of Congress all talk and no action? 1947: One more big question: will Mr Obama call for Congress to put a price on carbon? 1945: Lawrence Grenier from Corpus Christi in Texas, US, writes: As our neighbours to the east of us struggle with the now imminent destruction of their wetlands, marshes and beaches, I hope the armchair experts realize that the environment is but one factor to be reckoned with. This tragedy will come at an astronomical financial cost as well. Gulf coast resorts and local business will lose, pensioners of BP will lose and, without any defence, migratory birds, fish, mammals will lose their habitats. 1945: Questions continued: How exactly will Mr Obama compel BP to create an escrow account to compensate individuals and businesses affected by the spill? What are your thoughts? 1939: Ed Hornick, AC360, CNN President Obama must angle his address to the nation on the gulf oil disaster as more of a "warlike update" than the kind of addresses given by past presidents on national tragedies, a top presidential historian said. "This is going to be a different kind of president address... like we're in the middle of the war and he's giving an update on the war on the Gulf," said Douglas Brinkley, a professor of history at Rice University. 1938: Brian Woodahl from Indianapolis, US, writes: I find it unacceptable that Barack Obama finds it reasonable to bash BP. Most of this is done to enhance his political posturing in light of the upcoming November elections. 1937: Big questions for tonight: what will Mr Obama say about the fate of deepwater offshore drilling in the US, especially given how much coastal communities are already hurting from the current moratorium? 1936: You can send us your thoughts on Mr Obama's speech here. 1930:The BBC's Steve Kingstone in Washington Barack Obama will use his prime-time address to reassure the American public that he understands the scale of the challenge and is ready to hold BP to account. He will reiterate his administration's principal demand: that BP pay into an independently-administered account to compensate those affected by the spill. 1928: White House staffers are hoping for tonight to be an "inflection point", a moment where confidence in the administration's ability to handle the crisis is restored. What do you think? 1926: White House officials have indicated that Mr Obama will use the opportunity to present his vision for America's energy future, and use his bully pulpit to pressure Congress to act. 1917:The BBC's David Willis in Washington A recovery czar is to be appointed. President Obama is expected to talk about that person. Also, prevention is expected to be a part of his speech... On the crucial aspects of the discussions with BP, for example whether or not BP has agreed to suspend the dividend, we will probably have to wait until tomorrow. 1914: We also expect Mr Obama to announce regulatory changes to help prevent future spills. This will probably include some reorganisation of the Minerals Management Service, which was, prior to this spill, the government agency charged with overseeing oil drilling. Administration officials indicated Mr Obama would call for a body that acts as a "watchdog not a partner" of the oil industry. 1910: According to administration officials, we can expect the president to outline plans for the ongoing clean-up effort, as well as longer term plans to restore the Gulf. Look for the area to be described as having "unique beauty and bounty". 1905: Welcome to our live coverage of President Barack Obama's first Oval Office address to the nation. On the agenda tonight: oil, oil and a bit more oil. The president isn't just battling the worst environmental disaster in the nation's history, he's trying to combat the growing perception that his response to the BP spill has been inadequate. Tonight we'll be updating this page with up-to-the-minute news, analysis from our correspondents, some of your emails, and rounding up the best of blogs and tweets.